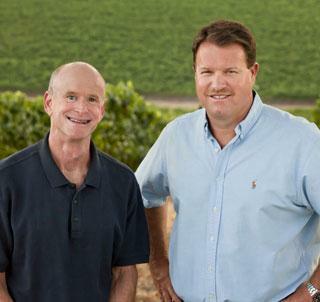 Dutton-Goldfield Winery began with a handshake in a vineyard in 1998, when longtime colleagues and friends Steve Dutton and Dan Goldfield recognized a shared vision between them--to craft wines that express the personalities of their cool-climate vineyards, and which they'd enjoy drinking at their own dinner tables. After graduating from Boston's Brandeis University, Dan headed west to begin a career in research chemistry, with a few detours for skiing and hiking on the way. Always an outdoor enthusiast, the life of lab work was quickly replaced with a dream of winemaking when his brother turned him on to the 1969 Burgundies. Dan entered the University of California at Davis, graduating with an M.S. in Enology in 1986. He gained knowledge on the job with stints at Robert Mondavi Winery and Schramsberg as well as winemaking in Portugal for two years. He found his passion in Pinot Noir and Chardonnay, first as the winemaker at the Burgundian-focused La Crema Winery, and then at Hartford Court, which was created under his direction. Dan's appreciation for the beauty of the extraordinary landscape around our home is reflected in his winemaking. Wine Enthusiast 93"Crafted from six vineyards within the Dutton family's holdings, this is a pretty wine, smooth and supple with a balance of acidity and light body. Citrus and apple vie for attention with a slight tropical note and expansiveness of ginger cookie and toffee." Wine Enthusiast 94Editor's Choice"This is a memorable wine, with enticing and complex aromas of gorgeous ripe fruit accented by cedar, tea and forest floor. The palate echos the aromas with vibrant and rich flavors, while the mouthfeel is firm and bolstered by fine-grained tannins." Wine Spectator 91"Well-structured, with rich layers of creamy fig, melon and apricot, gaining depth and complexity on the long finish. Drink now through 2011. 3,981 cases made." Wine Spectator 90"Starts out delicate and fragrant, with wild berry, raspberry and black cherry aromas, yet builds intensity, depth and complexity, revealing its depth of concentration. Drink now through 2013."